As we pulled up at Bluestone we couldn't contain our excitement at getting into our accommodation. 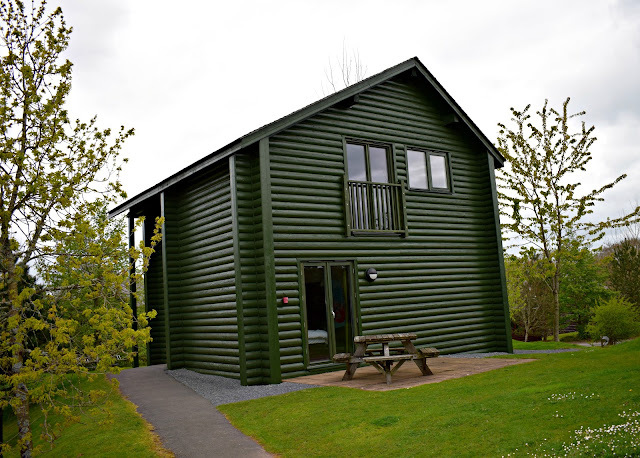 We've never stayed in a lodge before and had heard great things about the ones in Bluestone. As we were in a Ramsey lodge we were able to check in from 3pm and we eagerly appeared at the barrier to get in a few minutes early expecting queues but were met with none. We were let in along with our map we were handed at check in which showed us where to find out lodge. We didn't really need the map however as all the "street names" and places are clearly sign posted throughout the park so it was just a case of following these until we reached our area which was Forest View. Be warned though its all one way once you get into the park so if you take a wrong turn you have to go right round again. Once we had found our lodge it was a simple case of tapping our key card on the door to gain access. Accommodation at Bluestone consists of lodges, cottages and studio apartments with varying sizes to suit all needs. From the studios and 1 bedroom cottages that sleep 2 people to the huge Dina's bunkhouse lodge sleeping up to 14 and lots of choice in between. All lodges are set out on their own little pitch, with the exception to the Caldey lodges which can be found in two's as these lodges actually have a very clever door inside which can connect the 2 lodges if you wish (perhaps if you were holidaying with friends and both wanted your own lodge but to stay connected). 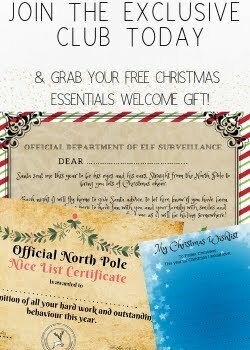 This can however stay locked if you don't know the family staying next door. We were given a Ramsey lodge for our stay and it was far better than we could ever have imagined. The Ramsey lodge is spacious and has that homely lodge feel but with all the mod con's such as dishwashers, wet rooms and a flat screen TV! 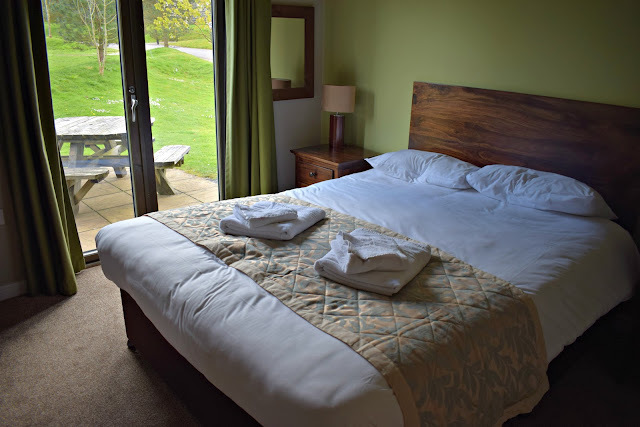 But what really makes the Ramsey lodge special is that it is actually "upside down living" with the bedrooms situated on the ground floor along with an ensuite bathroom for each bedroom. The living area, dining area and kitchen are all upstairs with an open plan living design for this area. Meaning that all the beautiful views at Bluestone aren't wasted as they are perfectly framed by a huge patio/balcony area in the living space giving you the opportunity to take them all in as you sit and relax. The lodge was really cosy and as I mentioned before came with all the mod con's. The dishwasher was a bit of a luxury to us as we don't have one at home so took a little while to work out how to use it. We also found a microwave, kettle, toaster and all the usual cutlery, plates etc. 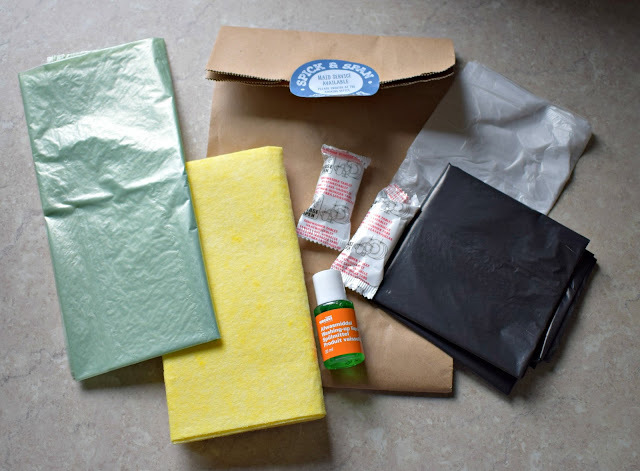 We were even supplied with a little starter pack that contained 2 dishwasher tablets, washing up liquid, bin bags and washing up cloths which was a lovely touch. The living area included a flat screen TV and dvd player which was perfect for the kids in the mornings. I loved the inclusion of a beautiful big table in the dining area which meant we could all sit together at breakfast and meal times, something I really miss being able to do at home so this got a big thumbs up from us! Downstairs in the bedrooms and ensuite we found all our bedlinen included as well as a bath and hand towel for each person. 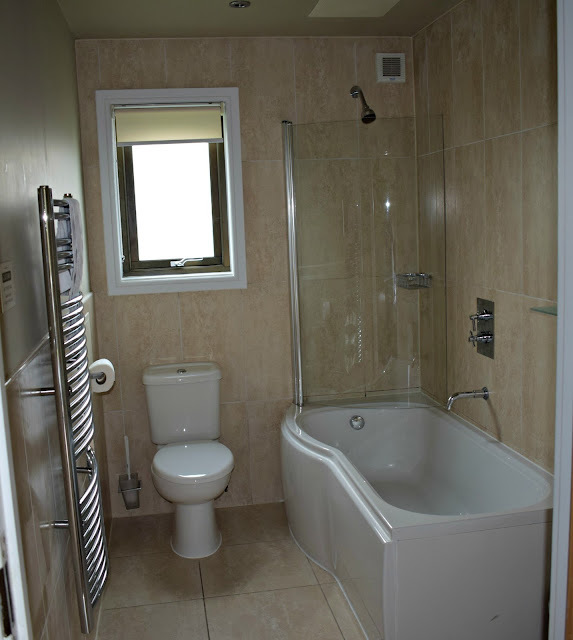 Our double bedroom ensuite had a toilet, sink and bath with a shower unit over the top of the bath. The twin bedroom ensuite had a toilet, sink and wet room shower unit which was ideal for washing the kids without getting a bad back trying to peer round a shower or lean over a bath. It also made it much quicker and less messy having the wet room available. There was only 1 issue we had with our lodge which was the beds (well more the mattress), these seemed quite hard and we struggled to get comfy at night. However I can appreciate that everyone has different preference for their mattress and it would be impossible to please everyone. The kids slept on theirs absolutely fine so perhaps its just that I prefer a softer mattress. Everything supplied with our beds was great though, the pillows were lovely and soft and the duvet super warm. I loved that all the lodges were on their own little pitch and you weren't overlooked by anyone. 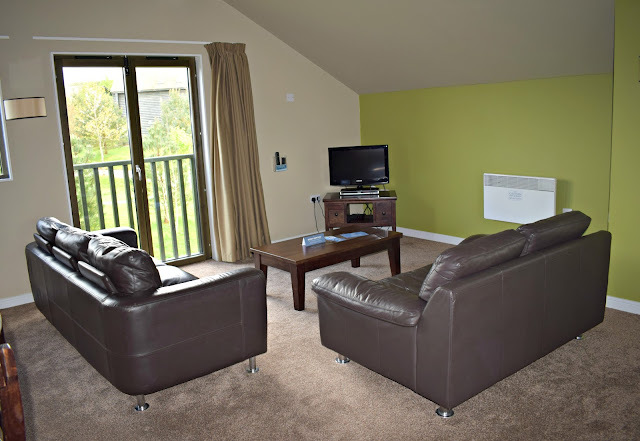 It felt private enough that you had your own space but still part of the friendly village atmosphere Bluestone offers. 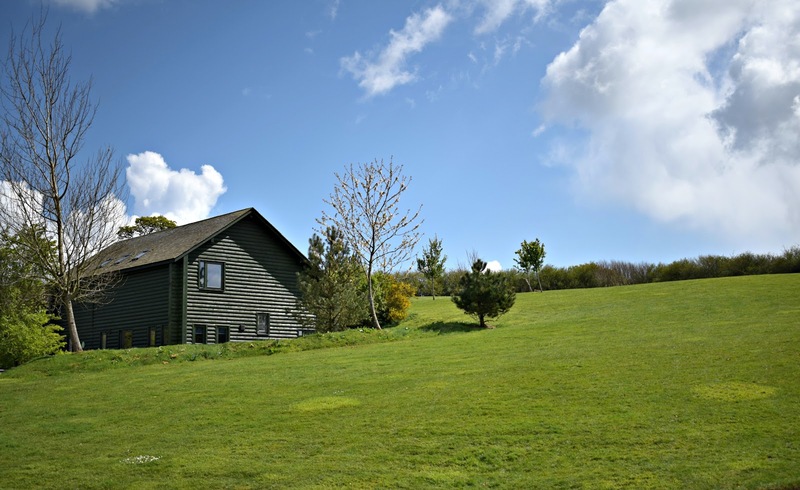 The lodges sit perfectly within the beautiful countryside landscape and rolling hills, clearly helped by the authentic wooden lodge style exterior. We really couldn't fault the lodge at Bluestone, they seem to have found the perfect balance between cosy lodge and modern amenities making your stay even more enjoyable. If you want to find out what we thought of the rest of the Bluestone site check out our Bluestone Stay post. Have you stayed at Bluestone before? If so which accommodation did you stay in?